You have the opportunity to give in a couple of different ways: your tithe and your offerings. The Bible teaches us that the tithe is an act of worship to the Lord, which is ten percent of our income given to our home church on a regular basis. When we give over and above our tithe, we do so as an offering. When you choose to give an offering, you may specify your intentions for the donation within the form. We are a recognized 501(c)(3) organization for taxable deductions. The church reserves the right to utilize designated donations where needed. 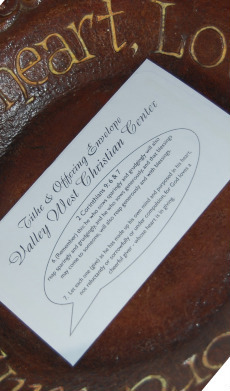 Creating a Valley West Christian Center online account through SecureGive https://www.valleyw.securegive.com with personalized user ID and password will not only simplify online giving as you use it regularly, but will also allow you to setup reoccurring giving, give one-time and access your church online giving statement for end of year reporting. Use of your user ID and password guarantee that all transactions are quick, safe and secure at all times. 2 Corinthians 9:7b-8 "...for God loves a cheerful giver. And God is able to make all grace abound to you, so that in all things at all times, having all that you need, you will abound in every good work."